LIGHTWAVES is a light sculpture and a professional development project developed by Manchester Central Library in collaboration with Curated Place and the kinetic artist, Paul Friedlander. 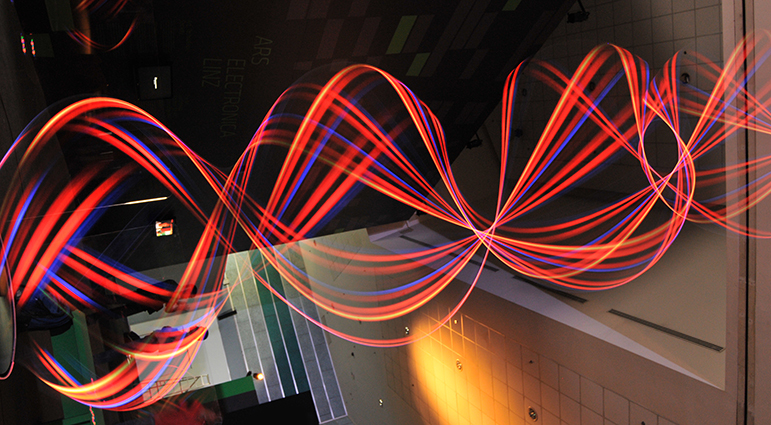 This site specific, kinetic light sculpture will be presented in the library’s main entrance hall during the Festival and consists of an overhead kinetic wave light display, which allows visitors to walk underneath. The waves continuously change shape and colour. Bands of spectral lines, sometimes multi coloured, at other moments a pure white come and go. The waves are lit with chomastrobic light, a form of light that changes colour faster than the eye can see. 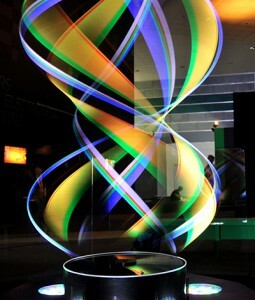 This light together with the computer control were invented by the artist, and have been developed over a period of many years. The artist explains that while we are all familiar with the beauty in sound waves, he has long been exploring visible waves that have expressive power, a music of light.